Today I am wearing two very different colours over a plain mid blue (leaning towards a grey) soak-off gel polish. The colour showing through the little port hole on the gelish bottle is accurate. The base is Harmony gelish, Up in the Blue. I am fairly new to using soak-off gels at home, I use the Red Carpet Manicure set. I love it and it is easy to use. Today I am focussing on the two colours I have applied over the gel base. 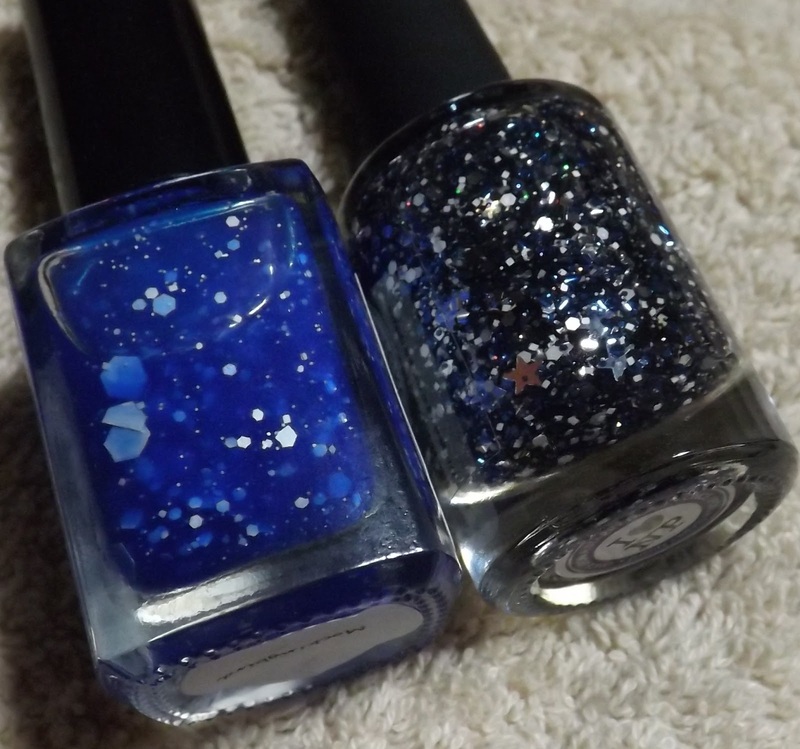 The colours I have chosen are Mockingbird by Liquid Lacquer and Once Upon a Starry Night by I Love Nail Polish. Both are very different from each other and it is not immediately apparent that they should be layered together. Yet, I think it works! ILNP was applied first over the gel. It is a clear base and is full of black and silver glitters, micro holographic sparkly bits and the very occasional star. I didn't even realise there were stars until I found on on my left ring finger. By chance, in the exact right place! If you want a lone star, this is the finger you want it to be and for it to happen by fluke was pleasing! It applies well and there is plenty of glitter. Mockingbird is a bright mid blue (think almost Nails Inc Baker Street) but with a translucent, jelly formula, filled with matte white discs and hexagons of varying sizes. A dream to apply and jelly like enough to allow the starry night effect to show yet blue enough to lift the whole effect. Here is a close up of the ring finger showing the fluke lone star! Both polishes are beautiful on their own, probably best as a topcoat in the case of ILNP Once upon a Starry Night and Mocking Bird builds easily with two or three coasts to be wearable as a jelly finished polish, with sky blue and white features... the colour of the polish tints the white. In conclusion, I think both polishes together work well. Perhaps better than being on their own! There is a beautiful blue, a variety of glitters and some sparkle, although the rainbow of sparkle is muted and tinted blue by the the Mockingbird. On the nails; a lovely bright blue filed with black, white and sparkly blue glitters. A jelly holding pieces of sparkle within. Fab. Both bottles showing their true colour. The rainbow of micro sparks are hiding in the ILNP but believe me, they are there. You can see the spark peeping through in the nail pictures. The blue of Mocking bird is complemented by the white hexes. The larger ones did tend to curl and as I am not a fan of very large glitter, I was able to pick them off my nails before it dried! ILNP and Liquid Lacquer polishes can be purchased from ETSY. All polishes purchased by me, nothing provided for review. Once Upon A Starry Night looks lovely with Mocking Bird! Thank you for sharing!